My main reason for starting this blog, ten years ago, was my frustration at the way Iran related news was reported in the Western mass media. I felt the Tehran based correspondents gave an unrealistic rosy picture of Iran so as not to upset the Iranian authorities and risk getting deported and I felt someone needed to tell the other side of the story. Ten years on, with the advent of citizen journalism, social media and more news websites in English by other Iranians fluent in both English and Persian, we do not have to only rely on reading the news from media correspondents, nevertheless it is still the mass media that has the largest readership and reading the mass media coverage of Iran news is still very frustrating at times. One such recent sloppy news coverage was that of Brigadier General Hossein Hamedani, killed in Syria earlier this month. It is clearly obvious from the above, Saeed Kamali Dehghan had no idea who Brig. General Hamedani was and had never heard of him before! The most important information that was not reported in the mass media's coverage of Brig. General Hamedani was that he was a commander of the Qods Force, the elite IRGC unit for overseas operations led by General Qassem Soleimani. In fact at times it seems the mass media in the West thinks the Qods Force is just made up of one person, Qassem Soleimani. Also missing from the mass media coverage was Hamedani's prolific role in the crackdown on Iranian protesters in 2009, particularly on the Ashura uprising as the head of Tehran's 'Mohamad Rasool Allah Corps.'. In his last media interview, Hamedani described how he had re-trained thugs and hoodlum who had been imprisoned before, for non-political offences, and had let them loose on the protesters. A crackdown method that has always proved very effective with the Islamic Republic ever since its inception. Hamedani despised the leaders of the Green Movement. After Moussavi, Rahnavard and Karroubi, the leaders of the Green Movement, were imprisoned, Hamedani claimed "Even if they repent, they will not be forgiven". In Syria he set up the National Defence Force, modelled on the Iranian ‘Basij’ militia". The NDF soon became another Islamic Republic engineered disaster in Syria. The indiscipline and lawlessness of the NDF not only led to much resentment by the regular Syrian military officers and the population but on 30th April this year, fighting broke out between the Syrian government security forces and the NDF outside Homs, resulting in several deaths. Hamedani was blamed for much of Iran's failure to bring the situation under control in Syria. He was recalled to Iran and demoted to be in charge of 'integrating the logistic equipments for Syria'. The IRGC official statement that came out hours later said Brig. 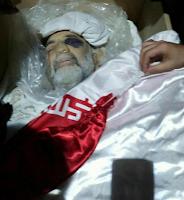 Gen. Hamedani was martyred while fighting IS forces. Of course to be killed by the 'Takfiri' infidels in battle is a whole lot more appealing than being killed in a road accident, but again the mass media bought the official Iranian line. What we got in the Western mass media regarding Gen. Hamedani's death, was a more or less copy/paste of the official Iranian news, an Iranian IRGC "advisor" was killed by ISIS in Syria! Thank you for this post! I had heard about an Iranian general killed by the Islamic State and, while I generally have little sympathy to members of Iranian security apparatus, I thought - the man has died for a good cause.